Very easy this week, just make sure that the frames are square and upright. You'll notice the wet glue on one frame, and the bit of paper underneath to stop it being glued to the jig. While waiting for week 12 parts to arrive, I built a jig to keep the keel straight until the deck has been fitted, and the hull sides have been planked. The jig. Quite a simple affair. 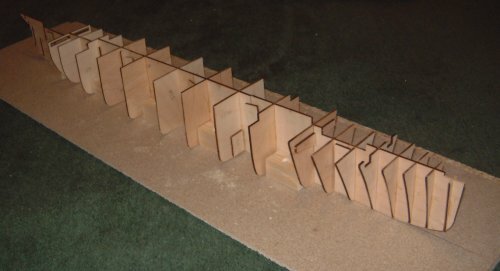 Just some blocks of wood screwed into some left over chip board. All made from left over scrap, so it didn't cost a penny, although it would only cost a few pounds to buy the bits. 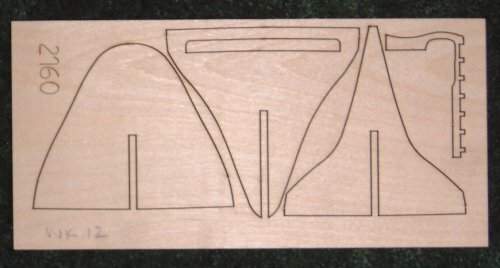 Draw a straight line on your board. 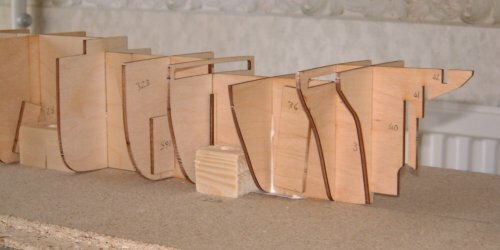 Cut some small blocks of wood, making sure that they fit between the frames. 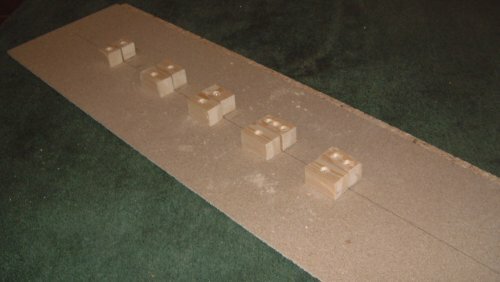 Screw one set of blocks to the board, using a straight edge as a guide. Also use the model to make sure they are properly spaced. Finally, put the keel against the fitted blocks, then push the second block against the keel and screw it in place. This will give the right sized gap so that the keel fits snugly without being too tight. This is the jig with the model in place. I've decided to stop the 'What we've been promised next week' section as it seems to serve little value.